Ms Maggie McGill with volunteer Stephanie, with her new well. With an estimated 844 million people with inadequate and unsafe water countries such as India, Mexico and Ghana come to mind. 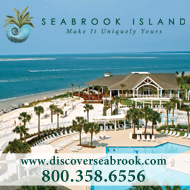 Despite our recent ‘water emergency’ in July, we live in the comfort of Kiawah and Seabrook Islands reassured that the Charleston water system, which in one survey, was ranked as the fourth best water system in the United States. 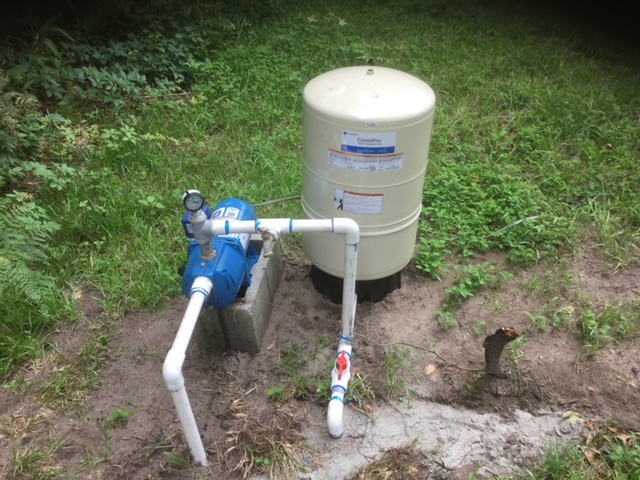 A new tank and pump on Wadmalaw, courtesy of Water Wellness Mission. Reassuring to be sure, but not for our neighbors on Wadmalaw Island where municipal water is not available. Whatever the reason for having to use well water – anti-development fervor or state and local financial constraints – the situation is dire for many residents. 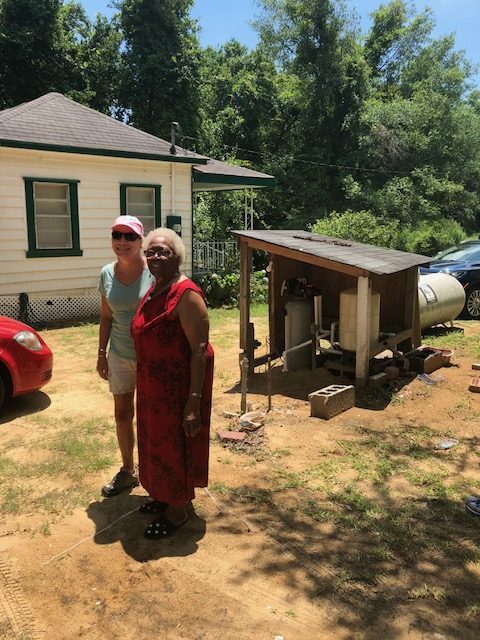 With 3 years of devastating weather events: the 100-year rain, Hurricane Matthew, and then Hurricane Irma, residents on Wadmalaw have been hit hard and left dry, or at least with water that’s not drinkable. all had traces of coliform bacteria and 88 had inorganics including nitrate/ nitrite (fertilizer), lead, iron and exceeded Environmental Protection Agency guidelines. To address this critical situation on Wadmalaw, the Water Wellness Mission raises funds and arranges the installation of new wells and filtration systems to those families in need. Bill Britton of Seabrook Island has organized the effort, which began in 2016. He notes that “right around the corner from us,” harsh poverty exists. Wells polluted by septic tanks and even dead animals has rendered many existing wells unsafe for drinking water. He emphasizes that Wadmalaw Island residents have no access to water and depend on neighbors and family members to provide this most basic of necessities. Water Wellness Mission and the Sea Islands Blessing Basket are two of the outreach projects that fall under the umbrella of Sea Island Hunger Awareness Foundation (SIHAF), a non-profit 501(c)(3). 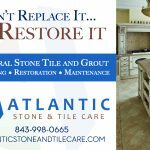 This year, the 2018 Alan Fleming Senior Open Clay Court State Championship (October 3–7) on Seabrook Island has designated the Sea Islands Blessing Basket as its charity. The Fleming charitable fundraising efforts have raised more than $40,000 in each of the past 5 years. Due to the critical need on Wadmalaw Island, an additional fundraiser, Margaritas and Mulligans, hopes to raise additional funds for the water mission. Margaritas and Mulligans takes place Tuesday, August 14 at the Seabrook Island Racquet Club. 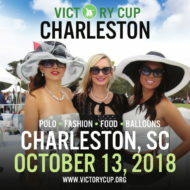 For more information, contact the Racquet Club at 843.786.7543. The Blessing Basket program distributes food to more than 500 families on Johns Island each month, supplementing diets with nutritious and healthy foods by providing a combination of shelf stable items with bread and fresh seasonal produce. To date, thanks to the generosity of donors, the Water Wellness program has provided wells to 33 Wadmalaw Island residents. An additional 32 wells have been approved leaving approximately 150 families in need of a well and access to safe water. For more information about the Alan Fleming Senior Tennis Tournament (October 3–7), visit TennisLink.usta.com and enter tournament id# 700053618. For more information about SIHAF, visit FightIslandHunger.org. All charity proceeds collected are tax deductible.